Hotel Director Pierre B. Camilleri. (Photo courtesy of Carnival Cruise Line). As Hotel Director of Carnival Vista, Pierre B. Camilleri has responsibility for nearly everything that makes up the guests' cruise experience including the accommodations, the dining operations, the bars, the entertainment and activities, the shore excursions, the casino, the spa and guest services. As part of the team that brought Carnival Vista into service, Mr. Camilleri is intimately familiar with the ship. In addition, Mr. Camilleri was hotel director on Carnival Breeze - - a ship that Mr. Camilleri also brought into service. (See interview). As such, he is well placed to contrast Vista against the ship that immediately preceded Vista into service. One of the first things guests who have cruised before with Carnival notice about Vista is the difference in the décor and atmosphere versus earlier Carnival ships. Vista employs lighter colors such as beige and pale blue. She is more like a contemporary hotel. A new feature offered on Carnival Vista is the Havana Staterooms and Suites. These cabins are designed to be like personal island resorts. During the day, they have exclusive access to the Havana Bar and Pool area. They also have larger outdoor lounging areas including for the suites their own exclusive portion of Vista's lanai promenade. 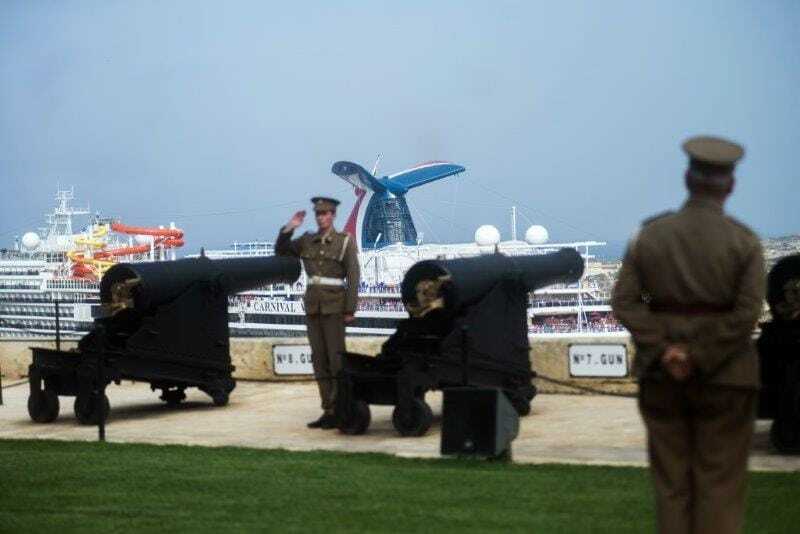 When Carnival Vista was in Malta during her European season, Mr. Camilleri, who was born in Malat, arranged for a cannon fire salute as the ship left the harbor. (Photo courtesy of Carnival Cruise Line). Deck 5 has also been redesigned inside. Guests may notice that the Ocean Plaza, the crossroads of the ship, is further aft than on Carnival Breeze.